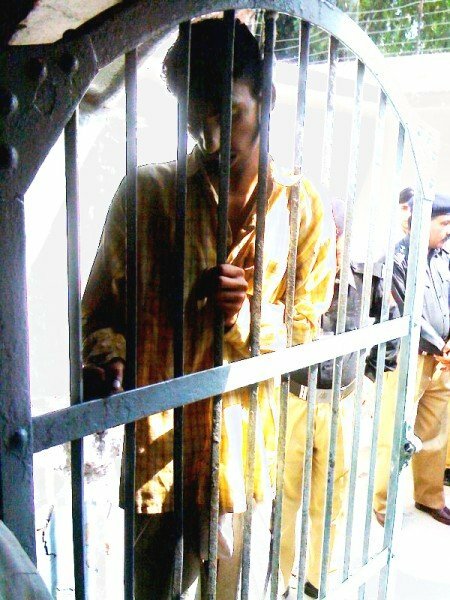 Sialkot (AsiaNews) – The young Christian man who was arrested on 12 September in a village in Punjab accused of blasphemy was killed last night in prison. Police had Fanish, 20, remanded into their custody in order to continue their investigation. This morning prison guards in Sialkot district prison found the lifeless body of the young man with visible signs of injuries. AsiaNews also received photos of the lifeless body. In it the type of injuries that can be seen appear unrelated to strangulation by hanging. The body is at the disposal of the legal authority, which has ordered an autopsy at Sialkot’s Civil Hospital. Fanish (pictured in prison) was arrested last Saturday after accusations of blasphemy were made against him. A day earlier a Muslim mob had gathered in front of the church in the village of Jaithikey, not far from the town of Samberial, in the district of Sialkot (Punjab), to teach the local Christian community a “lesson”. Extremists damaged the building before setting it on fire. They also pillaged two homes near the church. A relationship between the 20-year-old Christian man and a young Muslim woman appears to be the cause of the turn of events. Fanish was accused of provoking the young woman and of throwing away a copy of the Qur‘an she had in her hands. Yesterday the NCJP expressed “grave concern’ over the rising tide of violence against religious minorities, all in the name of the blasphemy law. For Catholic activists, urgent government measures are need. It is increasingly clear that profanations of the Qur‘an are just excuses used to attack non-Muslims, who are increasingly victimised and persecuted by Islamic fundamentalists. In another incident, also last Saturday but reported only today, a Christian settlement in Ghaziabad, a neighbourhood in Orangi Town, near Karachi (Sindh), was attacked by a mob of Muslims, enraged by blasphemy charges against a 40-year-old Christian man called Lawrence. After repeatedly attacking the man’s house with stones and rocks, the mob attacked local Christians and tried to storm the local Catholic Church. Only a quick intervention by police prevented a blood bath. Still police arrested Lawrence’s nephew, Shahkeel. The accused man went into hiding. Violence action by Pakistani Islamists is funded by foreign jihadist organisations. In fact, the Arab Herald recently reported that a Saudi charity gave 15 million dollars to a pro al-Qaeda militant organisation. The Tehrik-e-Taliban Pakistan (TTP) is said to be preparing to strike Punjab’s main cities. In conjunction with the Sipah-e-Sahaba Pakistan (SSP), the TTP is also planning to attack Pakistani Shiites. Sources told AsiaNews that the al-Qaeda-linked SSP was involved in the anti-Christian attacks in Gojra where several people were killed. The Al-Haramain Foundation, an organisation banned by the UN Security Council for its links to al-Qaeda, reportedly funded the attacks.